Your humble servant is no longer in any doubt that a secret society of death-worshippers has been established in Moscow, following the example of several other European cities: a society of madmen – and women – who are in love with death. The spirit of disbelief and nihilism, the crisis of mortality and art and, even more significantly, that dangerous demon who goes by the name of fin de siècle – these are the bacilli of the contagion that has produced this dangerous ulcer. 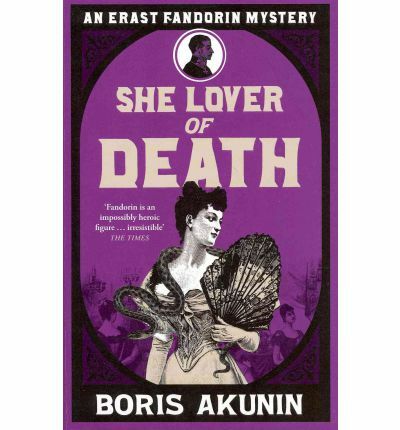 The eighth book in Boris Akunin’s Erast Fandorin mystery series follows an impressionable young girl from the tedium of Irkutsk to the bohemian glamour of Moscow with a quatrain in her hand and a small suitcase. Marya Mironova has cast aside her former life and name and is transformed into Columbine, following her lover (or soon to be) Petya whom she has named in her heart, Harlequin. And so begins the part-epistolary She Lover of Death in the form of newspaper clippings detailing the strange phenomena of suicides by young Muscovites, Columbine’s journal entries as she is initiated into a secret society worshiping death and spearheaded by enigmatic Prospero to whom she promptly loses her virginity. As each member of the Lovers of Death yearns to be chosen next, a mysterious stranger with a stammer joins the society under the alias Prince Genji. But as the deaths add up, it soon becomes clear that each Lover of Death is being helped along his or her way. Although Columbine is desperate to meet her lover (Death), her faith in her fellow society members is slowly eroded as she gets closer to Genji who begins to sow doubt on the whole enterprise. Of course, we know Genji is Erast Fandorin but the emphasis is strictly on Columbine and her dramatic take on her life and prospective death. In some ways She Lover of Death is less about the mystery of who is directing the killings than about the lure of bohemianism and the intense decadence of feeling alive in the face of death. Akunin has previously stated that he is deliberately writing each mystery as to mimic a certain style in the genre. And this volume certainly shows up the romantic allure of death in all its gothic glory which was so popular in fin de siècle European aesthetic. Prospero is reminiscent of Rasputin in his spellbinding ways and allure towards women and as Fandorin gets closer to who is behind the killings, will Columbine be strong enough to shake off her enchantment? As always, Akunin delivers an interesting view of Russian history and culture and the different style in each novel is a bonus boost in keeping us a captive audience. 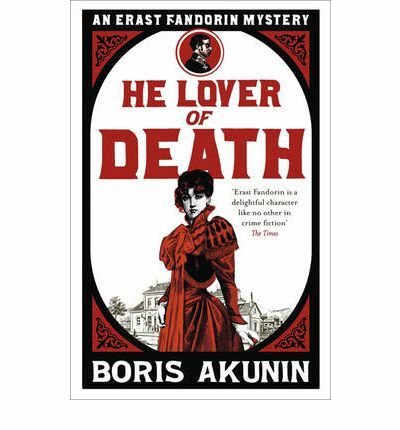 The next volume in the series, He Lover of Death, is down and dirty Dickensian with a dash of melodrama, the protagonist reminiscent of the Artful Dodger fleeing poverty to join a gang in the Khritrovka district of Moscow. It is here that Senka Skorikov meets and falls in love with Death, the beautiful mistress of the Prince who heads one of the most notorious Muscovite gangs. Death can sway all men and is also the cause of their demise. But this makes her even more irresistible. When Senka stumbles upon a hoard of lost silver, he manages to claw his way out of poverty but in doing so finds himself on the run from the gangs that rule Moscow and corrupt policemen who are out for a cut. It is only when he stumbles upon Erast Fandorin and his Japanese manservant Masa who have returned to Moscow and are independently investigating a number of savage deaths that may have links to the gangs that he has a chance of survival and his life truly changes. He Lover of Death had a very slow start and I admit it took me a couple of tries to get into this novel. However, the pace picked up after Fandorin turns up as the mystery of the deaths and the origins of the silver hoard are revealed. There are villains aplenty and lots of talk of love and honour. Fandorin, as usual, is as eccentric and mysterious which is why we find him so intriguing and he is as susceptible to Death’s charms as any man. Masa features a bit more in this volume, teaching Senka his Buddhist philosophy and defensive arts. I found their interactions highly enjoyable although the way Akunin reduces Masa’s speech in Russian/English to a stereotypical bad accent began to feel rather offensive. We all know he speaks Russian with an accent so is it really necessary to make is so Fu Manchu-esque? It my have been the norm before but we no longer live in a society that finds this acceptable. I never used to find these things offensive since we all know not all nations are equally cosmopolitan in their immigration policies, however, the internet has opened my eyes to different shades of ignorance and for someone as culturally sophisticated as Akunin, it’s a little disappointing. Apart from that one annoying detail which occurred a lot since Masa featured a lot in this novel, I still love Akunin’s work. I think he’s creating something playful, informative and well written in a genre that can sometimes feel formulaic. The next volume in the series is The Diamond Chariot set in Japan where I hope we’ll get to find out more about how Fandorin and Masa met. There are still four more volumes available in Russian and the next one is being translated into English. Hurray! Winner of the 2015 Palme d’Or in Cannes, Dheepan tells the story of Sivadhasan, a former soldier fighting for the Tamil Tigers, who assumes the name of Dheepan along with a fake family, 26-year old wife Yalini and 9-year old daughter Illayaal, in order to escape the conflict zone in northern Sri Lanka and start a new life in France. All three have lost family, are alone and need each other in order to apply for asylum in France. Yalini dreams of crossing over to England where her relatives live in peace but Dheepan is eager to settle down and needs his constructed family in order to secure a living. That they are relocated to a housing project in Le Pré-Saint-Gervais, a northeastern suburb of Paris, swapping one conflict zone for another doesn’t faze him as he goes about his job as a caretaker for the block of flats. But both Yalini and Illayaal struggle in their new job and school. As well as pretending to show they are a family, they also struggle to communicate in French, a language in which only Illayaal is becoming fluent, depending on her translation to get by. As they slowly adjust to their new life, a grim reality far removed from their expectations, the gang violence which has been simmering under the surface of the housing project explodes, threatening to break their hard-won, fragile peace. I was expecting a dark and depressing film about the horrors of the Sinhala-Tamil conflict transposed to the violent and terrifying banlieues of suburban Paris. But what I got was a beautiful, still film exploring the core values of family and belonging, strengthened by the extreme horrors faced and overcome by people. The Sinhala-Tamil conflict provides the backdrop from which Dheepan and his makeshift family spring into the contemporary and relevant refugee crisis facing Europe today; they are but one of many fleeing conflict to come to Europe believing it would provide a safe haven in which to start new lives. The desperation which drives them to undergo such a dangerous journey, the difficulties that arise once they reach their new country, the language barrier, the hostility and disinterest, make you re-assess your views on asylum seekers. That they dream of going back knowing there is nothing left of their old lives, the pain of having lost loved ones, their determination to carry on, all of this is shown beautifully in Jacques Audiard’s stark, spartan film. Nothing is over-emphasised or over-sentimentalised, nothing heavily pushed onto the viewer. Surprisingly, and probably what makes the film work, is that it chooses to steer clear of the complex politics of the Sinhala-Tamil conflict instead focussing on the personal and Dheepan’s relentless need to escape, to find normality in a world that has gone crazy. I loved how the makeshift family slowly coalesces and becomes a real one. Yalini’s cry that she isn’t Illayaal’s mother and her reluctance to look after her. Illayaal’s need for comfort in a cold, unfamiliar world of strangers. And Dheepan’s awakening interest in Yalini. You wouldn’t expect such a family to work, not with the anxiety accompanying the situation. But it slowly does and you feel for all of them. But while their ties grow stronger, the world outside grows ever more violent, once again putting their lives at risk. What was particularly striking was the grim urban reality in which Dheepan and his family land in suburban Paris. It is nothing like what they were expecting, where the poor, mainly immigrant communities, noticeably absent from the centre of Paris, are trying to eke out a living. Although the Sri Lankan parts of the film didn’t seem as stereotyped perhaps because the scenes were shorter, those set in Le Pré-Saint-Gervais did feel a little reminiscent of films like Banlieue 13 and Le Haine with perhaps a slight romanticisation of gang life. But Dheepan, once a child soldier, is unafraid and eventually manages to wrestle a bit of autonomy in the housing project but this too seems a little unrealistic. With exceptional performances by Sri Lankan novelist turned actor Antonythasan Jesuthasan in the titular role, whose past mirrors that of Dheepan, South Indian stage actor Kalieswari Srinivasan as Yalini, French-born Claudine Vinasithamby as Illayaal and Vincent Rottiers as gang leader Brahim, these are but minor points in what is almost a perfect film. You can read interviews of Audiard in the Guardian here and the Los Angeles Review of Books here. I was kindly invited to a screening of Dheepan which is out in cinemas today. I strongly urge you to watch it.